Suggested substitute for Propylene Oxide. It is reported as noncarcinogenic, less toxic and not as flammable. High purity; miscible with water, alcohols, acetone and epoxy resins15. Detailed description under Araldite 502 Kit. Detailed description under Background Buster. UV Catalyst for Prod. No. 18183 LR Gold; use at 0.5% w/v, ~365nm. Arsenic compound. Highly toxic. Hygroscopic. Nguyen KB and Pender MP, 1989. Assessment of Demyelination in Glycol Methacrylate Sections: a New Protocol for Cresyl Fast Violet Staining. Stain Technology 64:4, pp. 163-167. Cell permeable fluorescent minor grove-binding probe for DNA (powder). [41638-13-5]; Specific gravity 1.14.; Epoxy flexibilizer; Viscosity 33.6; Cp @ 25°C. Inactivated by water. Store in dark in vacuum desiccator. Rapid Chemical Dehydration of Samples for Electron Microscopic Examinations. L.L. Muller and T.J. Jacks. The Journal of Histochemistry and Cytochemistry. Vol. 23, No. 2, pp.107-110, 1975. 2,2-Dimethoxypropane, a rapid dehydrating agent for scanning electron microscopy. W.S.Johnson, G.R. Hooper, B.F. Holdaway, and H.P. Rasumssen. Rapid Chemical Dehydration of Biologic Samples for Scanning Electron Microscopy using 2,2-Dimethoxypropane. Morton D. Maser and John J. Trimble, III. The Journal of Histochemistry and Cytochemistry. Vol. 25, No. 4, pp. 247-251. Optimization and Investigation of the Use of 2,2-Dimethoxypropane as a Dehydration Agent for Plant Tissues in Transmission Electron Microscopy. J.R. Thorpe and Diana M.R. Harvey. Journal of Ultrastruture Research, 68, 186-194 (1979). Double-distilled. Moisture sensitive. Hardener for epoxy resins. Viscosity 290-295cP, density 1.005g/ml. Substitute for "Epon®" recipes and our Medcast. Excellent results with traditional EM specimen block preparations. WPE 140-150. Viscosity @ 25°'C 130-170cP. Specific Gravity 1.24. Moisture sensitive. A Cycloaliphatic Epoxide Resin specially formulated to take the place of ERL 4206 which is no longer available. Histological Fixative. Phosphate Buffer. pH 6.9 - 7.1 at 25°C. Note: ACS Reagent Grade Formalin (35 - 38% Formaldehyde, 10 - 15% Methanol) larger quantities available on request. Coating glass slides - adhesive. Cryosectioning16. Used to adhere SynapTek grids to the GridStick. JB-4® Plus Embedding Kit for light microscopy is a water soluble, GMA based, plastic resin kit intended for use in the preparation of embedded samples for high resolution light microscopy. Its cooler acting accelerator system offers greater heat protection of tissue components. It yields semi-thin sections (0.5 - 2µm) with excellent morphological preservation. Crystal clear non-yellowing casts are obtained at room temperature in 90 minutes or less. Resin (acrylic) only, no catalyst included. Requires Catalyst Prod. No. 18186: UV, benzoin methyl ether SDS (99KB PDF) (~365nm) (0.5% w/v); "blue light", benzyl MSDS (~460nm) (0.1% w/v); benzoyl peroxide SDS (113KB PDF) (1% w/v), cold-cure. Accurate measurements of catalyst are very important. LR Gold can be used at low temperatures (-25°C) and has proven very useful for immunogold procedures. Very low viscosity: 8cP. Applied to both LM (enzyme histochemistry) and EM (immunochemistry) techniques. 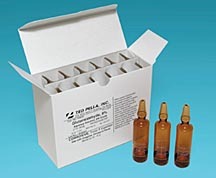 Resin with initiator (BPO) packaged separately. Accelerator 18185 can be used for cold-cure (room temperature). Heat cure is 24 hours between 50°C and 65°C. Gelatin capsules are recommended for temperatures below 60°C. Tightly closed BEEM® Capsules and PTFE Molds with ACLAR® as cover (Cat. No. 10506 or 10508) work well at 65°C. Widely used because of excellent immunolabeling results. 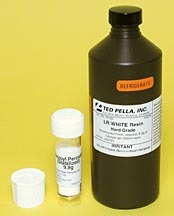 LR White is a polar, monomer polyhydroxylated aromatic acrylic resin (see PTFE Molds). Newman GR: Use and abuse of LR White. J. Histochem, 19, 118, 1987. Resin with catalyst packaged separately. Accelerator 18185 can be used for cold-cure (room temperature). Heat cure is 24 hours between 50°C and 65°C. Gelatin capsules are recommended for temperatures below 60°C. Tightly close BEEM® Capsules and PTFE Molds with ACLAR® as cover (Cat. No. 10506 or 10508) work well at 65°C. Widely used because of excellent immunolabeling results. Methyl-5-norbornene-2,3-dicarboxylic anhydride. Moisture sensitive. Viscosity 225-275cp, density 1.23g/cm³. Hardener for epoxy resins. Solid vaporizes by sublimation. Should be used only under the hood. Affects eyes. Use eye protection. EM Grade, glass ampoules in black paper. No sticky labels. Osmium purity >99.95%. Light sensitive. "Great care must be taken with osmium tetroxide. The crystals melt at 40°C and are extremely slow to dissolve in water. Both the crystals and diluted aqueous solutions give off fumes of osmium tetroxide, even at 0°C. It has an extremely low TLV (0.0002ppm). Osmium fixatives must therefore always be handled in a fume hood (cupboard), and because they act so rapidly, skin contact must be avoided at all times." TLV= Eight hour average Threshold Limit Value measured in milligrams per cubic meter of air. EM grade. Paraformaldehyde aqueous solution (methanol free). Pre-scored amber ampules sealed under inert gas. EM grade. Paraformaldehyde aqueous solution (methanol free). 100ml. Fixative. Polyoxymethylene. White free-flowing solid pellet (prill) with strong, pungent formaldehyde odor. Avoid strong oxidizing agents, temperatures above 38°C. Substrate component. Water-insoluble. Good thermal and mechanical stability. Because of small mass thickness, electron scattering within the film is low. 0.3-1.5% solution in chloroform, filtered through filter paper. 1,2-epoxypropane. Must use under hood, and with all caution. Extremely low vapor pressure. "Since epoxy resins are soluble in ethanol and acetone, dehydration is commonly carried out with one of these solvents. Because epoxy resins are more readily soluble in propylene oxide. 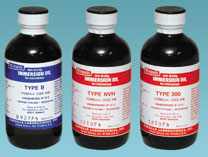 This solvent is frequently used immediately prior to infiltration with the resin. Most resins are not readily miscible with ethanol". Propylene Oxide does not separate from the epoxy resin during curing, thus small amounts left in the resin do no harm. Luft introduced Propylene Oxide into epoxy mixtures with his landmark paper and helped bring about improved embedding cures, better ultrastructural research results with blocks that would more reliably section and give better performance under the EM beam by reducing viscosity and increasing penetration. Normality 1.98­2.02, pH 8.6. Recommended: Bils RF: Electron Microscopy Laboratory Manual and Handbook, 2nd ed., 1992, p 154. 0.05% toluidine blue in benzoate buffer pH 4.4 (benzoic acid 0.25g, sodium benzoate 0.29g, water 200ml). p 5:3.11, "Procedures in Electron Microscopy". Positive or negative stain, EM. May cause adverse mutagenic or teratogenic effects. A Gadolinium Triacetate based stain as an alternative for Uranyl Acetate stain. Delivers comparable results without the authorization, shipping and disposal issue involved with Uranyl Acetate. 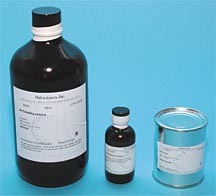 Uranyl Acetate alternative is a non-radioactive stain; supplied as a concentrate. Works well for staining of plastic embedded animal and plant materials and a negative stain for macromolecules. Not recommended as a fixative. Reference article: Masamichi Nakakoshi, Hedeo Nishioka and Eisaku Katayama. New versatile staining reagents for biological transmission electron microscopy that substitute for uranyl acetate. Journal of Electron Microscopy 60(6): 401-407. 2011. Vinylec® E is a drop in substitute for Formvar® (polyvinyl formal). The original manufacturer (Monsanto) has sold parts of the business and the similar replacement product is now manufactured under the name Vinylec® E.
Vinylec® E (Formvar® substitute) is an excellent and one of the most widely used material to make support films on TEM grids.